A fire in a gym, destined to be a shelter for hundreds of migrants and refugees, means a southwestern German town is now unable to accommodate any more asylum seekers. Police suspect arson. 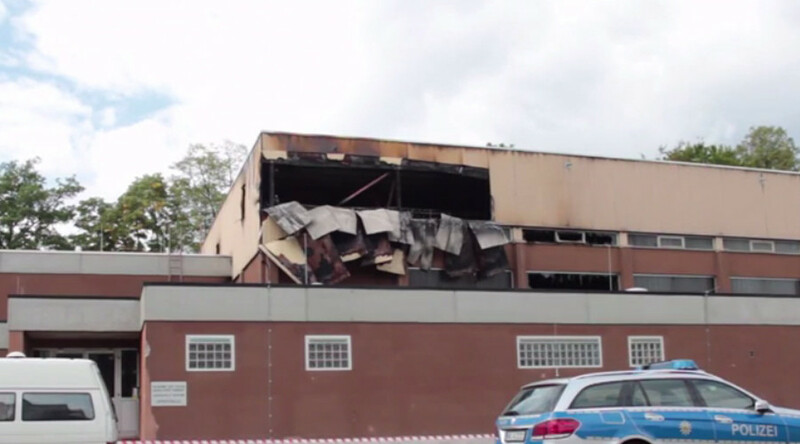 An overnight arson attack on a sports hall, prepared to become a migration center with capacity for 400 people, has put the building in danger of collapse, the dpa news agency reported on Sunday. "No more refugees will come to [the town of] Wertheim, as there is no additional emergency accommodation," Hermann Schroeder from the Baden-Wuerttemberg state government said, as cited by dpa. The town with a population of about 22,000 already has an accommodation center for 600 migrants and refugees, and it is unable to take in any more. At the time of the attack there was nobody in the building, according to the police in the nearby city of Heilbronn, Reuters reported. Police suspect the fire was started deliberately, as in recent months there have been several arson attacks on buildings designated for asylum seekers. “We have to set clear priorities. We need our energy and resources for those who are fleeing war and persecution,” Hasselfeldt said. Following recently toughened border controls, the number of migrants and refugees entering Germany decreased by about 300 people per day, with 1,710 registered on Saturday, according to police. The worst refugee crisis since WW2 has put Europe’s “open doors” policy under threat, as hundreds of thousands of desperate migrants and refugees keep crossing the Mediterranean Sea fleeing conflicts in the Middle East and North Africa. The pressure provoked Germany, Austria, Slovakia and the Netherlands re-impose temporary border controls. Managing the influx of people led to a spat between Croatia and Hungary after an unexpected trainload of asylum seekers crossed Hungary’s border and angered Budapest. On Saturday, Hungary said its razor-wire border was complete and would limit the torrent of people, who regard it as a transitional point on their way to Austria and Germany. After five days of having its main border crossing with Serbia sealed off, Budapest has reopened a highway crossing that was a site of clashes between asylum seekers and riot police.